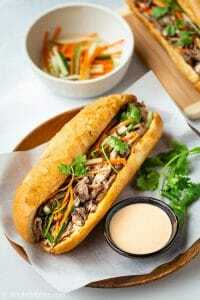 This pulled pork banh mi features Vietnamese baguette (banh mi) filled with tender and flavorful pulled pork, pickled vegetables, and tasty sriracha mayo sauce. With a slow cooker to cook the pulled pork, this delicious banh mi recipe cannot be easier to make. Banh mi simply means bread made from wheat in Vietnamese. I believe it was the French who introduced this bread to Vietnam. Though originated from the French baguettes, banh mi has distinguishing characteristics. The crust is usually thinner and crispier, and the white crumb is much lighter and airier than Western baguettes. In the US., you can buy plain banh mi from almost any shops selling banh mi sandwich. For example, when we still lived near Chicago, we bought plain banh mi from Ba Le Sandwich shop. If it isn’t an option, it is fine to use regular baguettes. The correct spelling for this bread is “banh mi”. A lot of places use “bahn mi” to refer to it, but it is incorrect. Vietnamese people often eat banh mi for breakfast. 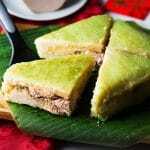 In fact, banh mi and noodle soups are among the most popular breakfast choices. We also eat banh mi alongside with some saucy dishes such as beef stew. 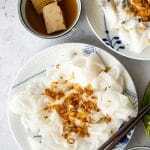 In the old days, many people even enjoyed dipping plain banh mi in sweetened condensed milk. For breakfast, Vietnamese banh mi is usually stuffed with fillings to make a sandwich. The traditional fillings for banh mi sandwich in the North are fried eggs, pate, pork floss, and Vietnamese ham. The Southern version can arguably be considered more exciting and flavorful with different types of grilled meat, pickled vegetables, and cilantro. I grew up with the Northern banh mi, and I only started to eat the Southern version more frequently when I moved to the US. 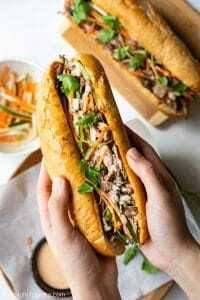 This Vietnamese pulled pork banh mi isn’t the most traditional version. 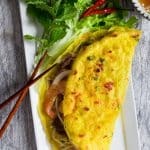 It is inspired by the Southern-style banh mi and we love to eat it for breakfast. The crispy bread, tender pork, crunchy vegetables, and slightly spicy tangy creamy sauce are what make it delicious and fulfilling. 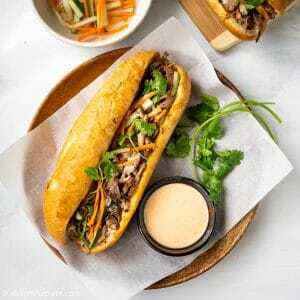 We always search for breakfast that takes little time to prepare in the morning and this banh mi sandwich recipe is the perfect solution. We cook the pulled pork in the slow cooker and pickle the vegetables overnight, and then assemble the sandwich in the morning. To make the pulled pork, you will need a reasonably fatty cut of pork such as pork shoulder or butts and spice rub. Slow-cooking the pork will render the fat while keeping the meat moist, tender and flavorful. 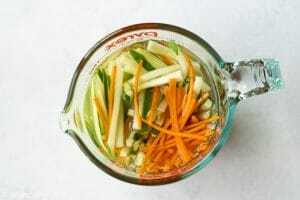 For the pickled vegetables, you will need crunchy veggies such as carrots, daikon radish or cucumber, vinegar (I recommend rice vinegar) and sugar. For the bread, as mentioned in the previous section, if you cannot find plain Vietnamese banh mi, substitute it with regular baguettes. The first step is to cook the pork in the slow cooker, which can be done overnight. 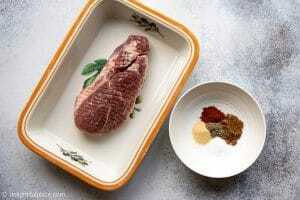 It’s not necessary to marinate the pork. Just rub it with spice, throw into the slow cooker, push the button and then walk away! You can pickle the vegetables for a couple of hours or overnight. Next morning, or whenever you want to eat it, make the sauce, lightly toast the bread until crispy, shred the pork and then stuff the bread with pork, pickled veggies, cilantro and sauce. Super easy and yummy! Can’t have enough of Vietnamese banh mi? 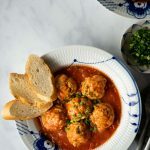 I think you will also like this Banh mi xiu mai (Vietnamese pork meatball banh mi). Combine salt, five-spice powder, garlic powder, paprika and black pepper in a bowl. Rub the spice mixture all over the pork shoulder/butts. Transfer the pork to the slow cooker, add the water. Cook on low for about 8 hours (or 6 hours on high) or to desired tenderness. Julienne carrots and cucumber (or daikon radish). If using cucumber, remove all seeds before you julienne them. In a jar or bowl, combine rice vinegar, water, sugar and salt, and then add the veggies. Cover, refrigerate to pickle for 2-3 hours or overnight. In a bowl, mix together mayonnaise, sriracha, lime juice and honey to make the sauce. Add salt and pepper to taste. Shred the pork. Slice the banh mi (or baguette) open lengthwise, fill with pulled pork, pickled veggies and cilantro, then drizzle with plenty of sauce. Serve immediately. If you want your pickled vegetables to be sweeter, add 1 more tablespoon of sugar. I like mine to be just slightly sweet. Making this tomorrow! Looks delicious. Excited to try something new. Thanks Talia! I’m happy to hear that you are going to try this tomorrow. Please let me know how it turns out for you. I really enjoyed it. The picked veggies and sauce were delicious, and everything tasted so fresh! Thank you so much for letting me know! I’m very happy to hear that :).